Shikhar Nature Resort is a perfect place for relaxation located on the banks of Bhagirathi river in Uttarkashi. The resort offers luxury tented accommodation in Uttarakashi. The resort is an idyllic retreat in the company of nature to unwind the self. The radiating aura and freshness of the place stimulates soul and senses leaving a rejuvenating effect to mind and body as well. It is a part of the Indian conglemorate Shikhar Group of Companies. 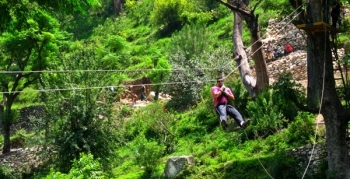 The resort located at 2 km from Uttarkashi town on Gangotri road. It is perched at an elevation of 800 mts above sea level. Famous attractions in Uttarkashi are Vishwanath Temple, Nehru Institute of Mountaineering, Himalayan Museum, etc. The resort is beautifully fused with the greenery around and gives you true camping feel in the woods with its spacious Swiss Cottage tents. The tents have attached bathrooms with western style toilets, showers & running cold water throughout the day. The staff avails hot water on request of the guests. Each tent comprises twin beds with space and option of accommodating an extra bed. The fully-furnished tents come with clean beds, blankets, bed sheets/pillows, chairs, tea table and bedside table. The resort offers its guests dining facility in its dining room as well as inside the room. The in-house kitchenette cooks marvellous flavours from all over the world then be it spicy Indian or the smoky Chinese, the resort offers it all in your platter. - TV with satellite channels, Attached Bathroom with Hot/Cold running water, Room Cleaning Service, Room Heater. - Doctor on Call, Travel Desk, Laundry Service, Car Parking Available, STD/ISD Facilities. - Luggage Storage, 24-hours Reception, Safety Deposit Box, Free Room Service. - Complementary : Yoga classes at 5:00 pm, Ganga Arti at 6:00 pm. - Activities in its own Activity Park, Rock Climbing Rappelling at Nehru Institute of Mountaineering and Artificial climbing wall, River Crossing & rescue at Asi Ganga. - The above price does not include applicable government taxes. - Half Day guided sightseeing tour of Uttarkashi, including Vishwanath Temple, Nehru Institute of Mountaineering, and Himalayan Museum. - Use of in-house games like Volleyball, Badminton, Carrom, Chess & Cricket. - Veg Meals: 03 Breakfasts + 02 Lunch + 03 Dinners. - Half Day guided sightseeing tour of Uttarkashi, including Vishwanath Temple, Nehru Institute of Mountaineering, and Himalayan Museum (transportation not included). The nearest airport is Jolly Grant Airport in Dehradun which is 199 km away, and the nearest railway station is Haridwar Railway Station is 200 km. 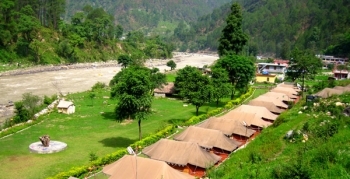 Rishikesh is 177 kms from Shikhar Nature Resort and Uttarkashi bus stop is at a distance of 5 kms.